This review has not yet been approved by the owner of this writing service. If you are the webmaster of Essayscapital.com, please Contact Us to approve or remove this review. The website is mostly pretty decent, with a neutral but not off-putting design and a fair amount of information about the service easily accessible. The only annoying feature is an unhealthy amount of filler text, but it is only to be expected. 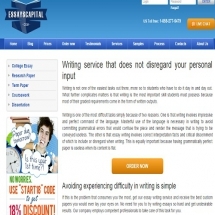 Prices at essaycapital.com are a bit higher than average and tend to differ a lot from assignment to assignment, ranging from $19.99 to $52.99 per page. The main factor influencing how much you are charged is urgency, from 10 days to as little as 3 hours. There are also supposedly 3 different levels of quality – Standard, Premium and Platinum, but the difference in price between them is negligibly small when compared to overall prices. One can’t but think that it is just for show. Curiously and suspiciously, the academic level of the task doesn’t come into play at all. Customer support is available via phone, online chat and phone and is pretty good whichever method you use. An operator gets back to you almost immediately, your questions are answered quickly and comprehensively in good English with no overly prolonged waiting times. Judging by the samples on the company’s website it is hard to see anything praiseworthy in its writing. Although grammar seems to be mostly correct, texts themselves make little sense, and it is obvious they were written by someone whose only goal was to put together the necessary amount of words.